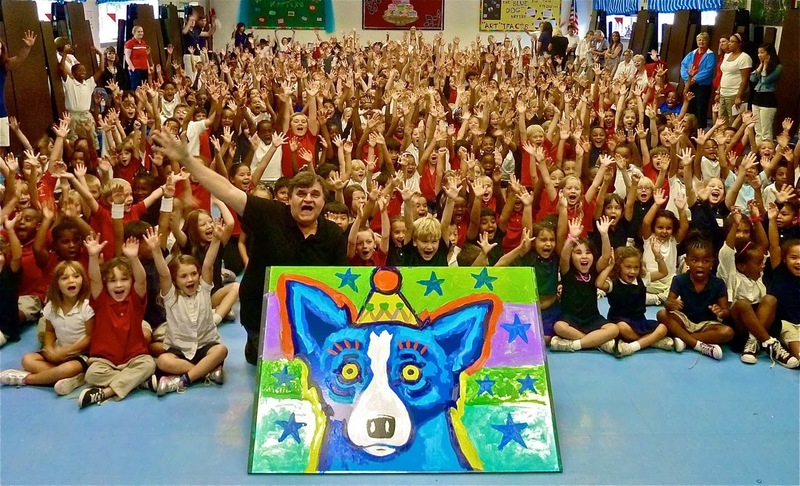 On October 26, 2013, George Rodrigue receives in New Orleans the prestigious Opus Award from the Ogden Museum of Southern Art during their annual gala, O What a Night!. Unable to attend the event, we asked Jacques Rodrigue, his fiancé Mallory Page Chastant, and André Rodrigue to accept the award on George's behalf, and to speak for us. Below is the speech in its entirety. I’ve always said that if I wasn’t born in Louisiana, I would have never accomplished what I have in the art world, because my career started out by trying to recapture old Louisiana, and to show how different our state is from the rest of the country. But as I got into it, I realized that every part of America is unique, and that many artists over the past 200 years captured the parts of the country that moved them most. 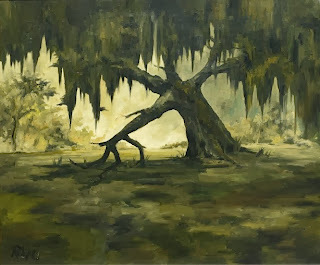 When I returned from art school in California in 1967, I saw Louisiana in a completely different way. I tried to create a style that would express the Louisiana of the past. As I got into it, I realized that this was just the beginning of a series that would lead into the present day, with subject matter including customs, traditions, people, and the landscape. 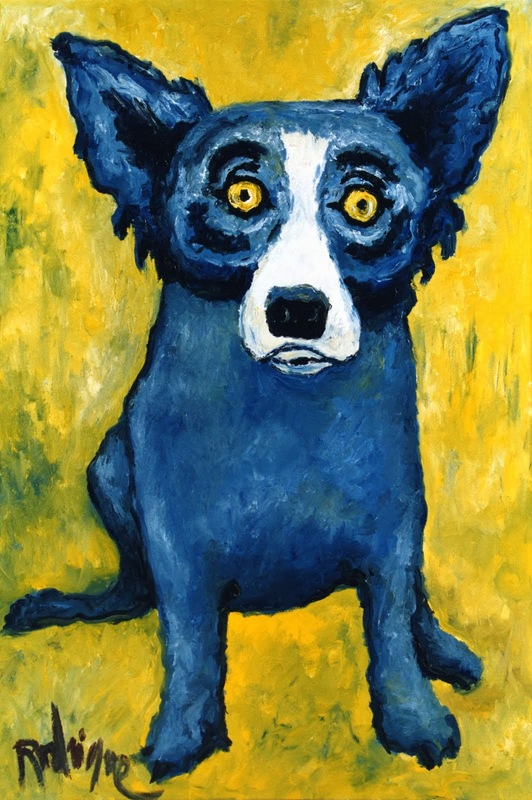 After 25 years focused on this premise, I painted an old French-Cajun tale of the loup-garou, which evolved over another 25 years into what the Blue Dog is today. As with my Cajun series, I had no idea it would last all of this time --- in my mind, on my canvas, or for the public. Meanwhile, Roger Ogden and a few friends had a vision to exhibit southern art and preserve it for future generations. This building has truly become a warehouse of southern treasures that probably would never have been appreciated to this extent were it not for their efforts. Both Roger and I started in Lafayette. 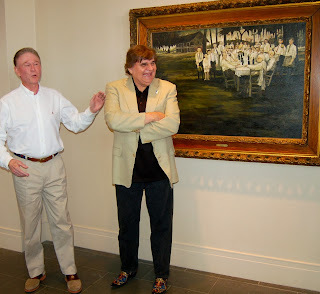 I remember hearing years ago that he was putting together a collection of local artists and southern artists, with the idea of opening a museum one day. From the beginning, I hoped to be a part of this story and legacy in some way. 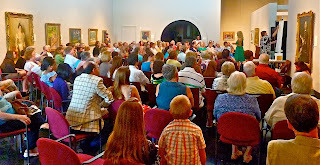 Thank you to everyone associated with the Ogden Museum of Southern Art for presenting me with the Opus Award. I am truly touched by this recognition. As George’s wife, I live a blessed life immersed in the arts. But it’s more than that. 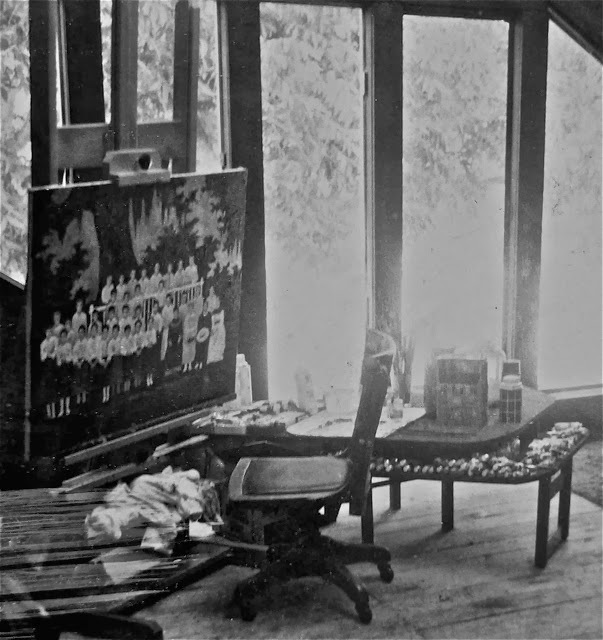 George has a unique way of seeing the world, both literally, as with his breakdown of oak trees and the interesting shapes formed between their branches, and abstractly, as in the life’s lessons gained from an illness, or the possibilities within space, dreams, and the origin of man. In 2003 the Metropolitan Museum of Art held an exhibition of Thomas Struth photographs. 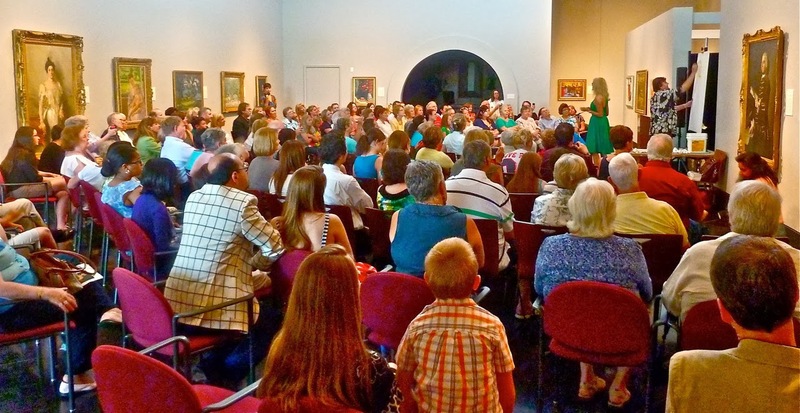 The life-size images showed museum-goers viewing great works of art. At George’s suggestion, we watched from around a corner as visitors approached a photograph and stared not at the image of people looking at a Degas street scene, but rather at the Degas street scene itself --- despite the fact that the actual painting hung on the wall on another floor of this same museum. ...said George. And through his observation, as I have many times in the past twenty-three years, I saw more clearly. Following the exhibition, we sat on a bench in the Metropolitan’s Great Hall. 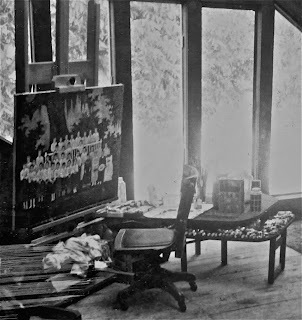 A video portrait by Struth illuminated a large wall, perhaps 20 or 30 feet high, between the columns. The giant head of a woman blinked her eyes or twitched her nose, while otherwise remaining still. Following that day long ago at the Metropolitan Museum of Art, we’ve known many wonderful recognitions and exhibitions for George’s art. As he predicted, however, the Metropolitan has not come calling! Yet, to our surprise, hanging in the greatest museum in the world no longer feels important. Rather, we’ve found greater personal rewards in the classroom, sharing our story and George’s vision with students. It’s the kids who bridge the art. We’ve learned that to be studied by a child is the best way to connect with the future and is more important than hanging on the walls with the great masters. We’ve also learned that the greatest honor is to be recognized by our peers, especially fellow Louisiana artists and art lovers. Similar to seeking the respect of one’s parents, all George ever really wanted was to be appreciated at home. We are both humbled and honored by George receiving the Opus Award, and we apologize, from the depths of our southern souls, that we cannot be there to thank you in person. So many voices on the first reading, fewer on the next, and only one on the last. 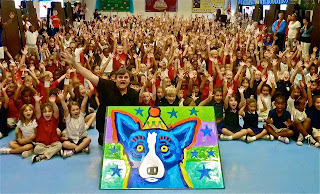 This is the way the Rodrigue art comes into focus. Now I'm not saying WHICH Rodrigue art! Congrats on the honor. I'm counting on MOMA: they think, and then they know. Like it or not, you're good! Congratulations! Even an old friend can see something new, and you continue to surprise, delight, and beyond create! Educate! Who knows what comes next? Congratulations to you for inspiring, enlightening and giving in so many ways to the youthful minds of New Orleans. 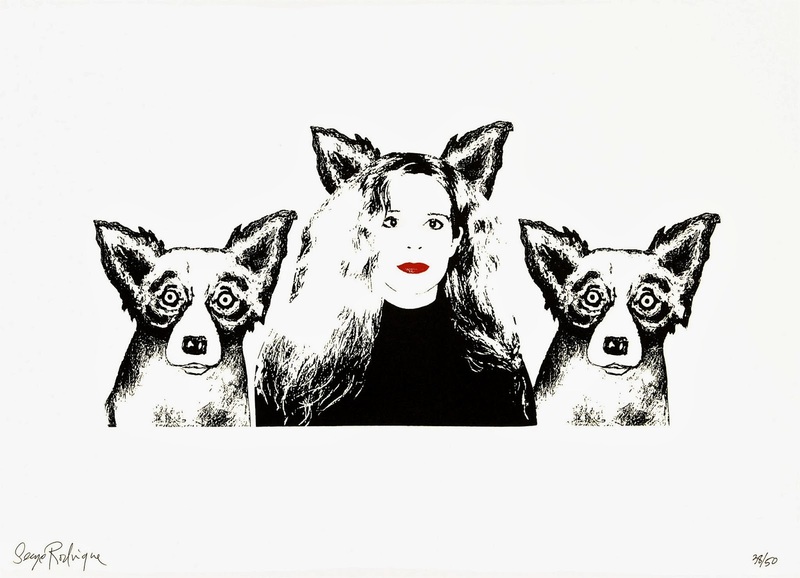 Your art is a constant source of pleasure and joy. Thank you. Love and prayers to the Rodrigue Family. Thank you everyone for these great comments. I hope MOMA's reading! HA!